Want to enhance your Local presence online, but aren’t sure where to start. Local SEO is an internet marketing method that helps business increase their visibility online. This techniques helps optimize your business website widening your client base and conversion rates. 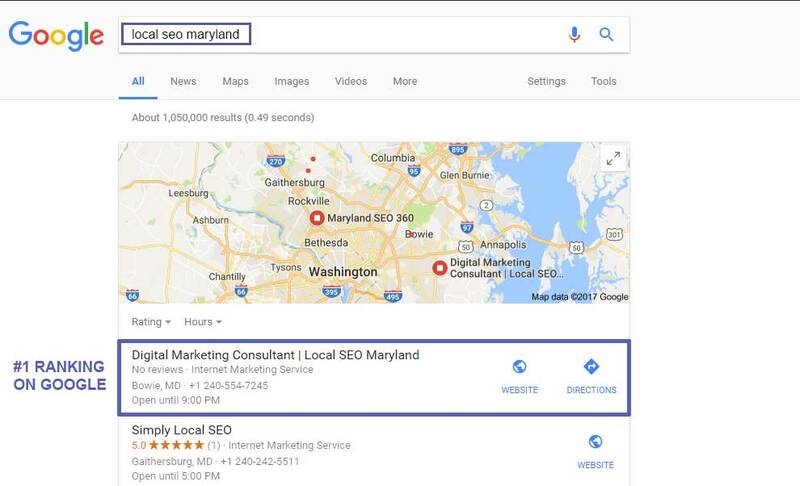 I am a digital marketing consultant straight out of Maryland (MD) offering a wide range of packages that guarantee results in major search engines. Our techniques are white hat SEO methods that guarantee your website will only benefit from our services and will not be penalized or harmed by our procedures. Our affordable local SEO packages help create a local presence for your business online. With citation building, ensuring consistent NAP all around, the establishment of quality backlinks, and the submission of your business information to business directories. With our Local Search Engine Optimization Packages you can ensure your business will have increased traffic, generate more leads, which in turn with give your website a higher conversion rate. Search engines like Google, Bing, Yahoo, and many more have evolved over time. Now when anyone picks up their phone, or uses their personal computer to search for anything, results are almost always customized to that person and their location. For example if a person in Bowie, Maryland (MD) is searching for a shopping mall, the search engine they are using, will give them results with the closest shopping malls near by. This is why having a Local Search Engine Optimization plan is so important. Think about how many opportunities your business has missed out on, because your website didn’t show up as one of the top results. With our local search packages your business will show up more frequently in search engines ensuring your business never misses out on another opportunity again. Still Not Sure Which Package to Choose From? Looking at the different packages you may be confused which one is best for your business. Don’t worry, if you have any concerns or question about the most compatible package for you. Or if you want more services that aren’t included in our package, please do not hesitate to contact. We will work hand in hand with your business to customize a specialized plan to fit your business websites needs. Local SEO (search engine optimization), is a specific kind of online marketing done to enhance your online presence locally. It is an effective approach to effectively boost your businesses/websites existence in a specific region you which to target. Working with Tuka Chalabi and Arckay Business Solutions has been great. They have created a new website, as well as minisites, for our clinic. Generating traffic and leads for our business. I have worked with Tuka for several years now. She has provided excellent service and helped our website rank in the top pages of Google. I really wasn’t sure how to get my website to rank or show up in the top pages of Google. Tuka, started out with a PPC campaign so my website was featured when people searched for things related to it, while she was getting it to rank organically. Thank You. With the direction of Tuka Chalabi and Arckay Business Solutions they have been able to help rank our website in the top three search results for the keywords we wanted. Its been a pleasure working with Tuka. She has been a great business partner and friend. She is an integral part of the business, always bringing great ideas to the table. I look forward to our future progress.